Zoolights has been a Tacoma tradition for many years and continues to be one of the top Christmas light displays in the Seattle-Tacoma area. And for good reason! The grounds of the Point Defiance Zoo and Aquarium get decked out in more than a half million tiny, sparkly lights that dazzle young children and adult visitors alike. Starting just after Thanksgiving and continuing until after the New Year, Zoolights is a sure bet to up the ante on your holiday season. You can still check out the zoo by day, too, and you can even buy a combo ticket that includes day admission to the zoo and night admission to Zoolights. In the entire South Sound, it's a toss up between Zoolights and Fantasy Lights in Spanaway as to which is the best, but Zoolights has the advantage for a few reasons. One of the top advantages is that you can make your experience last as long as you'd like at Zoolights, while at Fantasy Lights you get one drive through for the cost of admission and then that's it. 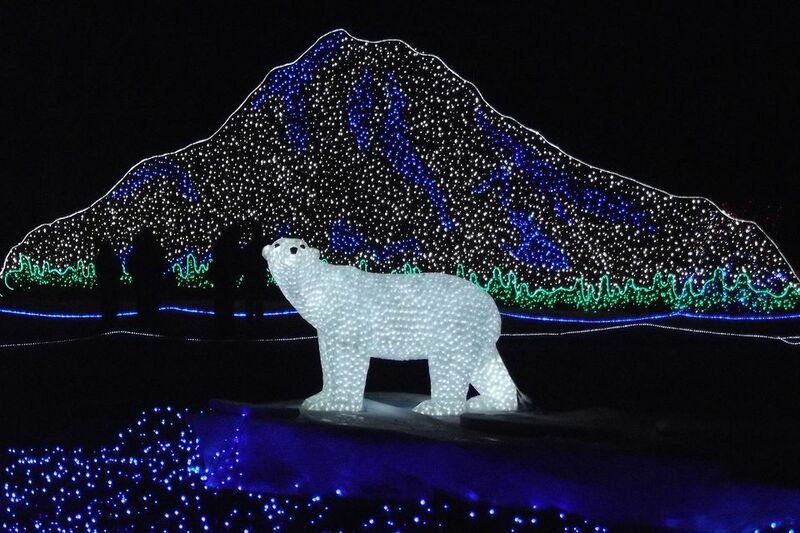 At Zoolights, buy a hot chocolate and wander the trails once, twice or more. Choose your own adventure. Zoolights also combines lots of general holiday merriment with the lights displays. The zoo's cafe is open so you can grab a snack or a hot beverage, ride the carousel, kids can even ride a camel! Of course, Zoolights is outdoors while Fantasy Lights keeps you in your car, so make sure to wear warm, waterproof clothes as winter in the Northwest is usually pretty soggy. You may get rained on, depending on the evening, but some buildings remain open so you can duck indoors and get out of the weather if you need to. If rain is just not what you had in mind, advance tickets are good for any night, so if you get rained out, you can choose to go another night. The best part of Zoolights is checking out the lights—take a stroll and admire glittering light displays in the shapes of animals and scenes from nature. Trees and bushes along the walking paths are also illuminated. Each year, many displays come back from previous years, but there's usually something (or somethings!) new to see as well. The flame tree is one of the most iconic repeat displays—a large tree decked out in pinkish-purple lights. Others that return each year include the Narrows Bridges, a giant octopus, polar bears and a herd of elk. A number of displays are also "animated" and different parts of an image light up at different times to create the illusion of movement—you'll see an eagle swooping down to grab a fish, parrots or monkeys zipping by overhead, or deer running in the forest. The atmosphere is surreal and magical and is sure to be a hit with children, but is often just as cool for adults—a stroll through Zoolights is an ideal date night idea. There are a few other things to do at Zoolights beyond enjoying the lights, including riding a camel. The ride is not long or extravagant, but it can be thrilling for young children (and a unique photo op for parents). An antique carousel is also on the premises and offers rides during Zoolights. There's a cafe near the zoo entrance where you can buy hot chocolate, coffee, and other snacks. Most of Zoolights is outdoors, but a few indoor areas remain open, including the South Pacific Aquarium where you can watch sharks and tropical fish and warm up as the building is always roasty toasty. The new Pacific Seas Aquarium will not be open during Zoolights, though, so don't promise your kids that you'll go see the sea turtles. Most of the animals are asleep by the time Zoolights starts, but a few remain awake, most notably the meerkats, which are also located in a covered area. There is ample and free parking inside Point Defiance. The zoo has its own parking lot and you will pass additional parking on your way there. If you come early in the season, you'll likely be able to park right near the zoo entrance. However, some nights can be very crowded and the lots can and do fill up. If the zoo lots are filled, you'll be directed to auxiliary parking at Owen Beach, Fort Nisqually, or others. There are shuttles to take you between auxiliary lots and the zoo entrance that run frequently all evening. Zoolights stays open until after Christmas, but don't count on the days after Christmas being low on crowds. Quite the contrary! These days can be very busy as everyone who didn't go before Christmas tries to check this off their lists before it closes! There is an admission fee to get in. The cost is cheaper for zoo members or if you buy in advance at the zoo, the zoo’s website, or from participating local vendors like Fred Meyer. Children ages 2 and younger are free. A number of combo tickets are also available, if you're interested in going to the zoo in the day as well. Kids 2 and younger are free! Tacoma's Zoolights is located on the grounds of the Point Defiance Zoo in Point Defiance—a large park on a peninsula in North Tacoma. Point Defiance is located at 5400 N Pearl Street.